Lyon, S. W., Quesada-Pineda, H. J., and Crawford, S. D. (2014). "Reducing electrical consumption in the forest products industry using lean thinking," BioRes. 9(1), 1373-1386. The forest products industry has an opportunity to reduce energy costs using energy management practices, thereby boosting its global competitiveness. Increasing manufacturing costs have contributed significantly to the decline of the forest products manufacturing industries in the U.S.; these increasing costs limit manufacturers’ abilities to compete with their global competitors. U.S. companies are continually improving their products, processes, finances, and business practices to better compete with global marketplaces; however, they may not be seizing all of the opportunities available through more efficient energy consumption practices. By eliminating non-valued added activities, lean thinking is an example of one tool that may improve performance and reduce costs. A case study was conducted at a cabinet manufacturer in Virginia to examine the impact of lean thinking on the consumption of electricity in the manufacturing process. An energy management system was used to provide rapid feedback on electrical energy consumption for production operations. Significant changes were observed after implementing energy reduction practices identified by lean thinking tools. Manufacturing in the U.S. has become extremely difficult primarily due to the growth of foreign production capability in the global marketplace. Competitive markets in today’s global economy are displacing forest products manufacturers not able to reduce their labor and manufacturing costs enough to compete effectively (Smith et al. 2004; Buehlmann et al. 2007; Buehlmann and Schuler 2009). While U.S. companies are continually improving their products, processes, finances, and business practices to better compete with global market places, they may not be seizing potential opportunities that are available through more efficient energy consumption practices. Energy consumption composes a large portion of manufacturing cost in various industries, sometimes up to 40 percent of total operating expenses (Fontelera 2009). Electrical costs in the U.S. have increased by 12% since 2006, increasing by 1.47 cents per kilowatt-hour annually; however, industrial electrical costs leveled off in 2009 as a result of there being fewer manufacturing plants in the U.S. (EIA 2013a). Because of increasing costs of infrastructure upgrades, the 2014 electricity price for the industrial sector is projected to increase by 1.9% (EIA 2013a). Increasing manufacturing costs might have contributed to the decline of the forest products (NAICS 321) and wood manufacturing (NAICS 3219) industries in the U.S.; these increasing costs limit manufacturers’ ability to compete with their global competitors’ pricing (Schmitt et al. 2011). The increase in global competition has led to a decline in domestic markets for U.S. furniture, severely impacting key wood products industries such as the Appalachian hardwood lumber industry (Bowe et al. 2001). The continued competitiveness and growth of the forest products and furniture industries depends on their ability to effectively manage all manufacturing costs including energy (EPA 2007). The forest products industry has an opportunity to reduce energy costs by using energy management, thereby boosting its global competiveness. Sustained energy management efforts provide significant cost-saving opportunities by recording energy consumption, managing peak load demand, providing energy trend data, and providing constant energy consumption feedback (Sarmiento 2008). Electricity costs may be significantly overlooked because they are often considered a necessary expense of doing business (Ross & Associates 2007). By eliminating non-valued added activities, lean production processes could take advantage of important opportunities to improve performance and reduce costs. A new development in the use of lean tools is to incorporate electricity consumption into the value stream map (Ross & Associates 2007). A value stream map is a conceptual mapping exercise that documents a visual depiction of flow of materials/products and information through the production process (Rother and Shook 2003). Before investing in new expensive technologies, it is recommended that managers consider lean tools, such as value stream mapping, to map, analyze, and implement best practices that help to increase production performance and general efficiencies such as electricity consumption (Ross & Associates 2007). The researchers designed and implemented a lean process project at a cabinet manufacturer in the Appalachian Region. The objective of the study was to assess the impact of implementing lean tools and practices on energy consumption within a segment of the wood products industry. The research team and a third party energy management firm installed the appropriate technology at the research site to quantify energy consumption before and after the lean project implementation. Lean thinking focuses on reducing waste and increasing value-added processes of products and services; the term “lean thinking” was created by Jim Womack while visiting Toyota in the 1980s (Womack and Jones 2003). Identifying and defining value is a key element in the lean process as Womack and Jones (2003:16) state that “value can only be defined by the ultimate customer and it’s only meaningful when expressed in terms of a specific product (a good or a service, and often, both at once) which meets the customer’s needs at a specific price at a specific time.” Specifying value is the first and most important component of lean thinking (Womack and Jones 2003); however, it could be difficult for a number of reasons, especially because the consumer identifies the value of the product. For this particular case study, lean thinking tools such as value stream mapping and Kaizen events are used to determine value-added activities, production waste, and energy saving recommendations (Womack and Jones 2003; Rother and Shook 2003; Ross and Associates 2007). A value stream map shows a visual depiction of the two forms of flow through the entire process: the flow of materials/products and information flow (Rother and Shook 2003). A Kaizen event is a group session of managers and employees focused on improving process performance (Liker 2003). Most critical recommendations are identified using Kaizen events and the steps to implement such suggestions are formatted using an A3 report. An A3 report (designed to fit on one side of an 11”x17” sheet of paper) is an adaptable tool used in lean manufacturing to solve process problems and implement solutions (Shook 2008; Sobek et al. 2008). In recent studies, value stream mapping has been applied in the forest products industry. Czabke (2007) claims that the overall goal of implementing value stream mapping in the forest products industry is to create a smooth, high-quality organization that is able to produce quality finished products at the rate of customer demand with minimum or no waste. Quesada et al. (2009) found that raw materials inventory is the largest contributor to waste (non-value added activity), while kiln-drying operations were the largest contributor to value added time. Kiln drying uses a species-specific schedule to dry lumber. The kiln drying process uses high temperatures along with air movement to increase the drying time and minimize defects of lumber (Bergman 2010). Under lean thinking, value-added and non-value-added activities is defined by the customer creating a customer driven process that pulls the product through production instead of pushing by the manufacturer (Womack and Jones 2003). This concept is called push vs. pull systems. In a pull system, material is not used until it is needed by the process. A pull system helps to reduce wastes in the production process. However, in a push system, the material is pushed through each process even when not required, creating excess items that become wastes (Lindeke 2005). Examples of value-added steps within the forest products industry are cutting and shaping lumber, drying lumber, reducing lead times, and reducing batch sizes (Quesada et al. 2009; Quesada and Buehlmann 2011). Examples of non-value-added steps within the forest products industry are reworking, excessive transportation, and waiting for materials (Quesada et al. 2009). Eliminating or trimming waste from the process should be done through the eyes of the consumer (Womack and Jones 2003). Table 1 shows the top electrical energy saving practices in the forest products industry. Rankings are based on practices with a 2 year or shorter payback period. 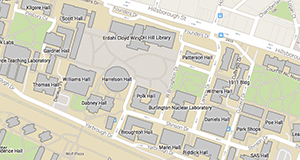 Table 2 is derived from the Industrial Assessment Center Database (IAC), which provides information on public assessments and recommendation projects for different industries (Rutgers Center for Advanced Energy Systems 2012). Utilization of higher efficiency lamps and/or ballasts is a commonly suggested energy saving practice, which was shown as the top ranked practice in Table 2 (Ross and Associates 2007). Air compressors are commonly used in the forest products industry (Table 2) for opening up kiln vents, cleaning off machines, and powering tools (Wengert 1974); however, air compressing systems are often a major cause of electricity waste. A significant spike in energy usage is most likely correlated with an air compressor problem, such as a leak or air supply running when not needed (Energy and Environmental Affairs, 2011). Individual leaks are difficult to locate and require time and effort to fix; however, repairing a leak can lead to significant energy savings (Wengert 1974). Fixing and constantly maintaining air compressors results in a fast payback period compared to other energy saving practices. The concept of allocating energy consumption to an individual production unit or product is relatively new. Current allocation procedures include simple allocation procedures such as direct, indirect, theoretical, and auxiliary energy consumption (Seow and Rahimifard 2011). Direct energy consumption is energy directly tied to a machine or process; for example, the motor that powers the gang saw is direct energy consumption (Seow and Rahimifard 2011). Incorporating electrical consumption into the value stream map allows the investigator to compare performance of process steps based on kilo-Watt per hour (kWh) per day. Using value stream map to incorporate electrical energy consumption is a relatively unchartered, yet, attainable area (Ross and Associates 2007). There has been a lack of research to provide a clear connection between lean thinking and energy consumption by product or process. According to the literature review, little research has been done in this area, suggesting there are no known studies on this topic in the context of the forest industry. An important part of the operational cost is electricity, but there has been little attention directed toward how to measure the impact of lean thinking on electrical consumption, especially in the forest products industry. The purpose of this research was to design and implement a lean process project in a cabinet manufacturer in the Appalachian region to measure the impact of lean processes on energy consumption. This project was designed as a longitudinal study to monitor energy consumption over time using an energy management system. This system allowed the researchers to cut costs by monitoring energy consumption via the internet and not requiring an in-person visit. The literature background leads the researchers to the following research question: How can lean thinking be applied to reduce the consumption of electricity in wood products industries? Because the case study firm had a continuous improvement team already in place, the researchers were able to implement the energy saving recommendations and test the null hypothesis (The implementation of lean thinking in the forest products industry has no impact on electrical consumption). The company selected in the case study had a lean thinking program in place. The researchers were able to implement the energy saving recommendations identified through the use of value-stream mapping and Kaizen events. Once recommendations were implemented, it was possible to determine if lean thinking (waste reduction) decreased electrical consumption. Figure 1 presents an overview of the methodology used in this case study. First, an energy management system (EMS) was installed by a private company. The EMS provided real-time feedback of electrical consumption throughout the research. Depending on the type of system, energy consumption can be tracked as often as 5 min intervals (Commonwealth of Massachusetts 2011). Next, the researchers worked with the manufacturer to identify the primary product (i.e., largest volume of production) produced at the site. Flat panels with maple veneers were identified as the product family for the case study. Next, a current value stream map was performed to show a visual depiction of the flow of materials/products, and information through the entire process was created in Microsoft Visio 2010 to visualize the process (Rother and Shook 2003). To examine energy consumption throughout the production process, the researchers included the daily kilowatt-hour consumption in the value stream map. The current state energy and value stream map for this specific case study can be described as two production lines forming one line with nine process steps. The first production line starts at the head clippers, followed by the guillotine, whole challenge guillotine (veneer splicer), and inspectors. The second line starts with the process of cutting panels to size. This is a highly automated process step that requires a lot of electricity to power the equipment to cut the panels to length. The flat panel press is where the veneers and panels are glued together under intense pressure and heat. Acquiring this intense pressure and heat requires high consumption of electricity over a long period of time. Both lines meet at the glue spreader, followed by the flat panel press and the last process step is shipping. It was determined that the cycle time for shipping was less than the takt time (the rate, in units of time, at which a customer demands one unit) causing overproduction of material and wasting electricity to store and transport that material. This was causing shipping to slow down to match the conveyor speed to meet demand on time and not to overproduce. One of the main recommendations to solve this problem was to reduce travel time on the conveyor, and therefore further reducing wasted electricity from the slow-moving conveyor. Additionally, when examining the process steps necessary to produce the veneers (head clippers, guillotine, splice, and inspection), it was apparent that the available time for each process step was higher. After further analysis, it was found out that the employees were not turning off the equipment during breaks at this process out of fear that the equipment will not start back up. While creating the current state value stream map, there was a noticeable difference in the total amount of area needed for the process step and the total amount of area needed for storing material. Storage area was extremely high compared to process step area. This creates a lot of underutilized space within the plant, causing the heating, ventilation, and air condition (HVAC) system to work in excess to cover the entire area. For this case study, the HVAC system incorporated humidity into the plant to make sure the veneers would not dry up, thus making indirect consumption a critical component of reducing electrical consumption. While recording data for the current state value stream map, the dust collection system was running for a set of process steps that were not in operation. After further analysis, it was discovered that the dust collection system was not able to alternate running for different process steps within the plant. The dust collection system was a high contributor to wasted indirect electrical consumption. Another interesting outcome of the analysis of the current state value stream map was the significantly higher lead-time (22.35 h) compared to total process time (18.2 seconds). Lead time is viewed as non-value added time whereas process time is value added time. That equated to less than 1% total value added time. In order to produce faster and on time to customer demand, non-value added time should be greatly reduced/eliminated, thus, decreasing waste. Finally, the data from the EMS were compared using one-way ANOVA to test the mean electrical consumption before and after the implementation of lean thinking principles. In order to conduct the test, electrical consumption data was extracted from the EMS before and after the implementation of the energy saving recommendations. Electrical consumption data was collected over one year for the case study. The current value stream map, along with the Kaizen events, and the energy audit helped to determine 3 Kaizen bursts (improvement opportunities) in the production process that may help to reduce energy consumption. The calculated savings, costs and payback period for each Kaizen burst can be found in Table 2. The first Kaizen burst addressed the issue of employees turning off their equipment during lunch break. By applying visual controls at each process step to remind employees to turn off the equipment during break, one of the eight wastes known as waiting is reduced and saved the company $694 annually. The second Kaizen burst addressed not being able to turn on different dust collectors individually within the plant. Through employee suggestions for improved efficiency and the results of the energy assessment tool, the most critical energy inefficiency (i.e., savings opportunity) occurred because of the inability to turn on and off different dust collectors. Further analysis indicated that the dust collection system was not properly retrofitted and maintained for the plant which caused inefficient use of energy. The initial cost for retrofitting the equipment was $3,500 to allow alternate start-up for each motor and creating a total productive maintenance schedule for the dust collection system and may result in savings of over $3,100 per year and has a payback period of little over a year. The third Kaizen burst addressed the issue of a long and slow conveyor located in shipping that builds inventory and is constantly running during the available time of the process step. Shortening the length of the conveyor and increasing the speed on the conveyor, creates a pull system designed to match at which the customer demands the product. By creating a pull system, the third Kaizen burst reduced waste in the form of over-production. In addition to the energy savings, the available time for the veneer process decreased to 27,000 seconds from 28,800 seconds, impacting the total direct consumption per day. The third Kaizen burst proposes to reduce the travel and available time for the shipping process step but at a high cost with a long payback period of 699 years (based only on electricity savings). This shows that not all Kaizens are effective solutions in reducing costs and energy consumption. By combining both the first and third Kaizen burst, the potential for reducing total direct consumption was 26.36 kWh per day or 6,958 kWh/year. The second Kaizen burst had the most reduction in electrical consumption with a 119.2 kWh reduction per day or 31,448 kWh/year. The total amount of savings after implementing all of the Kaizen events saved the company $3,857 annually. Because the case study firm had a continuous improvement team already in place, the researchers were able to implement the recommendations and test the null hypothesis (The implementation of lean thinking in the forest products industry has no impact on electrical consumption). Figure 2 shows daily consumption, in kWh, over the span of a year by day of the week before and after implementing lean energy reduction practices. Electrical consumption was clustered by day of week in order to make comparisons based on same weekdays. Saturday and Sunday were days that the manufacturer did not operate, thus; they were not included in the analysis. As it can be seen from Fig. 2, electrical consumption began to decrease after the implementation of the recommendations. It is important to mention that a similar plot was generated showing kWh per production unit (square footage) in order to verify that electrical consumption did not decrease due to a decrease in the production volume. the implementation of lean thinking principles. The electrical consumption for Friday had a lot of variability after implementing the energy reduction practice. The high variability of electrical consumption was most likely due to variable production volumes for the day. Figure 3, shows the yearly electrical consumption compared to the case study production rate. The researchers observed a positive trend between yearly production and electrical consumption. There is also a noticeable decrease in electrical consumption after the energy saving recommendations were administered. The data collected over the span of a year (before and after implementation of recommendations) from the EMS was used to statistically test the null hypothesis. In order to conduct the statistical test, electrical consumption was separated into two groups for each day of the working week: before (B) and after (A) the implementation of the recommendations. A one-way analysis of variance (ANOVA) was used to test for differences among more than two categorical variables (Table 4). The mean electrical consumption before and after was compared using a one-way ANOVA to test significance. Table 3 shows the outcome of the one-way ANOVA test for a significance level of 0.05. The results reject the null hypothesis that the implementation of lean thinking principles in the forest products industry has no impact on electrical consumption. The data shown in Table 3 displays an impact on electrical consumption, thus, allowing the researchers to reject the null hypothesis (The implementation of lean thinking in the forest products industry has no impact on electrical consumption). Each day of the week showed a significant difference in electrical consumption before and after the implementation of the energy saving recommendations. For the day with the highest energy consumption (Monday), electrical consumption dropped from 1045 kWh to 835 kWh per day after implementation of the lean energy practices. Thursday and Friday were the days with the most variable electrical consumption likely because of the high variation in production for those days. For this case study, the researchers estimated that implementing lean tools and principles over the span of one month (22 working days) resulted in potential savings of 3202.32kWh a month or 38,427.84 kWh a year. With the U.S. average cost per kWh currently at 10 cents (EIA 2013b), the company would realize a reduction in electrical costs of $3,842/year. Considering the production levels and that the estimated cost per square foot is $0.4235, this energy savings can be translated to a 0.27% of production cost per square foot. Another interesting result is the fact that after installing the EMS and talking with the employees, the researchers noted that the company was more conscious of their electrical consumption. This awareness could be attributed to the constant feedback of the system, particularly because trends in energy reduction can be noticed on a day to day basis. As the project progressed, the company began to implement electrical energy saving recommendations such as installing energy efficient lighting, remote sensor lighting, and replacing motor belts more frequently. 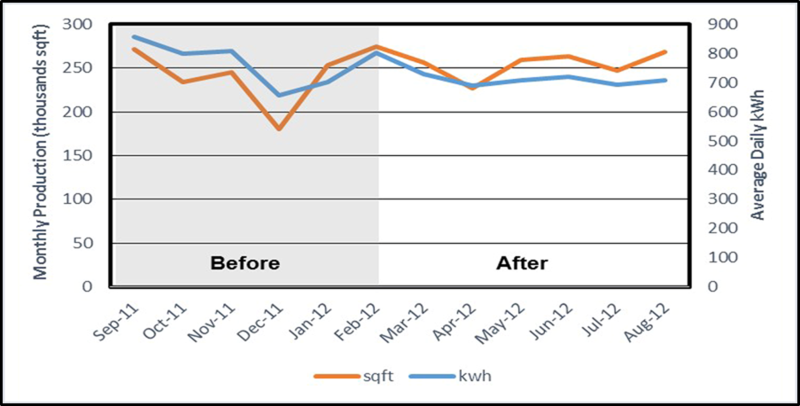 Day-to-day data on electrical consumption improves an investigator’s capability to see clear trends. Future research in this field should explore the incorporation of other energy sources, such as oil, coal, and wood chips, into the value stream map, as well as the possibility of using other process maps for recording energy consumption and comparing process mapping techniques. Lean principles are just one of the process improvement ideologies used to save energy in this field. Future research should strive to find an effective combination of process improvement methodologies for reducing electrical consumption for the particular case study. The implementation of lean thinking in the forest products industry has an impact on electrical consumption. After implementing the energy reduction practices at the cabinet manufacturer, results showed a significant drop in electrical consumption when compared to pre-energy reduction conditions, with significance (p=0.0001) for each day of the week. Incorporating energy consumption into the value stream map allows the auditor to visualize the process, including any bottleneck in the production line causing a high demand of energy thereby affecting production costs. Lean principles have additional value in that employees who are involved in daily activities related to production can contribute to the identification and implementation of energy-saving practices. Not only does this opportunity create potential for energy reduction, but also empowers employees, resulting in engagement with the manufacturing company. The authors are grateful for the support of the US Forest Service’s Wood Education and Resource Center and the Department of Sustainable Biomaterials at Virginia Tech. Buehlmannm U., Bumgardner, M., Schuler, A., and Barford, M. (2007). “Assessing the impacts of global competition on the Appalachian hardwood industry,” Forest Products Journal 57(3). 89-93. Buehlmann, U., and Schuler, A. (2009). “The U.S. household furniture industry: Status and opportunities,” Forest Product Journal59(9), 20-28. Liker, J. K. (2003). The Toyota Way: 14 Management Principles from the World’s Greatest Manufacturer, McGraw-Hill, New York. Quesada-Pineda, H., Haviarova, E., and Slaven, I. (2009). “A value stream mapping analysis of selected wood products companies in Central America,” Journal Forest Products Business Research. 6(4). Web. Quesada, H., and Buehlmann, U. (2011). Lean Thinking: Examples and Applications in the Wood Products Industry, Communications and Marketing, College of Agriculture and Life Sciences, Virginia Tech. Blacksburg, VA. Publication 420-002. 15p. Rother, M., and Shook, J. (2003). Learning to See: Value-Stream Mapping to Create Value and Eliminate Muda. 1.3 Ed., The Lean Enterprise Institute. Cambridge, MA. Sarmiento, J. O. (2008). “Electricity demand and energy consumption management systems,” Cornell University Library. 1. Web. Seow, Y., and Rahimifard, S. (2011). “A framework for modeling energy consumption within manufacturing systems,” CIRP Journal of Manufacturing Science and Technology 4, 258-264. Shook, J. (2008). Managing to Learn: Using the A3 Management Process to Solve Problems, Gain Agreement, Mentor, and Lead, The Lean Enterprise Institute, Inc., Cambridge, Massachusetts. Smith, P. M., Dasmohapatra, S., and Luppold, W. G. (2004). “A profile of Pennsylvania’s hardwood sawmill industry,” Forest Products Journal. 54(5), 43-49. Sobek, I. I., Durward, K., and Smalley, A. (2008). Understanding A3 Thinking: A Critical Component of Toyota’s PDCA Management System, Taylor & Francis Group, LLC, New York City, New York. United States Energy Information Administration (EIA). (2013a). “Short-term energy outlook,” January 8. Accessed: Jan. 25, 2013. Available on: www.eia.gov/forecasts/steo/report/electricity.cfm. United States Energy Information Administration (EIA). (2013b). “Electricity monthly update,” Accessed: May 29, 2013. Available on: http://www.eia.gov/electricity/monthly/update/end_use.cfm#tabs_prices-3. United States Environmental Protection Agency (EPA). (2007). “Energy trends in selected manufacturing sectors: Opportunities and challenges for environmentally preferable energy outcomes,” Fairfax: ICF International. Accessed: Jan 25, 2013. Available on: http://www.epa.gov/sectors/pdf/energy/report.pdf. Womack, J. P., and Jones, D. T. (2003). Lean Thinking: Banish Waste and Create Wealth in Your Corporation, Free Press, 396 pp. Wengert, E. M. (1974). “How to reduce energy consumption in kiln-drying lumber,” USDA Forest Service, Research Note: FPL-0228. Article submitted: July 19, 2013; Peer review completed: November 18, 2013; Revised version received and accepted: January 22, 2014; Published: January 27, 2014.